East Lansdowne’s history is somewhat different from other present day Delaware County communities. The joining of numerous individual farm parcels in a piecemeal fashion created most other townships and boroughs, however East Lansdowne retains the distinct history of having been bought as one family farm, specifically for residential development. Along similar lines with nearby municipalities is the attachment of the original farm parcel with notable settling families—in this case the Sellers/Lewis/Smith families. At the turn of the century, this area was geographically a part of Upper Darby Township, and belonged to Dr. George Smith. Dr. Smith, a well known figure in the region’s development, was State Senator, a Delaware County Judge, the enactor and advocate of the public school system, first superintendent of the schools of Delaware County, president of the school board of Upper Darby, on the Board of Directors for the West Chester and Philadelphia Rail Road, an incorporator of the Delaware County Mutual Insurance Company and founder of the Delaware County Institute of Science, among a vast many distinctions. He is also well known for his book on the history of the county, published in 1862. Smith’s wife, Mary, was originally part of the Upper Darby Lewis family, and a cousin of the Sellers and Pennocks. Although the Smith’s are noted to have lived in Upper Darby, this farm, which was to become East Lansdowne Borough, was a part of the Smith family’s land holdings. Lansdowne, and brought in civil engineers Harris and Damon, from Darby, to survey and plat the approximately 130 acres into streets and lots. Opening day for lot sales was June 9, 1902. The prices for lots were between $160 – $440, $2 down and $1 – $2.20 per week. There were no taxes, no mortgages, and no interest for a year. With an offer as desirable as this, development began to occur. There were already 30 homes built and occupied by June of the following year, including one twin house and one store. The town experienced a building boom following their separation from Upper Darby and incorporation on June 3, 1911. Growth happened rapidly, in an overall view of municipal development. The land surface of East Lansdowne was built-out by the 1940s and the decade of the ’50s saw the peak population of this borough, at approximately 3,500. 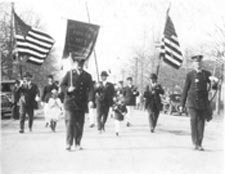 The residents had previously started up the “East Lansdowne Improvement Association” in 1904, to serve as the unofficial governing body. From this group grew Fire Company No. 1, as well as the idea to become their own municipality. Every property owner was eligible for membership in the East Lansdowne Improvement Association and likewise encouraged to advocate in all measures for the ultimate benefit of the community. Although the Association was dissolved in 1916 for the forming of the first Borough Council, the ideals of true community have never been forgotten in East Lansdowne. East Lansdowne is almost exclusively residential, and having been sold, designed, and built within a very short period of time has given it a very orderly and consistent feel as a community. Outside of the small commercial districts along Baltimore Pike and Oak Avenue and Long Lane, the Borough is filled with shady tree-lined residential streets, providing a uniquely safe, walkable, and homey environment. There is an abundance of Victorian Vernacular, Craftsman Bungalow, and American Foursquare styles of homes, present in both twins and singles, illustrating the fashion and themes of early 20th century residential architecture. Many of these homes have retained a great deal of integrity, including an great quantity of original fishscale shingles on the Victorians. Baltimore Pike, as the southern boundary, places East Lansdowne in a location that is easily accessible both to adjacent Delaware County communities as well as a direct link to Philadelphia. Penn Boulevard, north to south down the center of town remains a wide street, serving as a reminder of days before when the trolley line ran through from 69th Street.